Most of our prosperous allies take advantage of U.S. taxpayers. American forces in or near their countries let them underspend on security and funnel the difference into generous social programs, exposing both Americans and friendly countries to unnecessary risks. The federal government’s job is to protect and serve American citizens, not to subsidize wealthy foreign nations. American presidents have complained about cheapskate allies for decades, even during the Cold War. President Trump has focused on it more than most, but few in Congress and the public realize how bad it is. To hold our allies accountable to the American people, Sen. Mike Lee (UT) has introduced the Allied Burden Sharing Report Act of 2018. 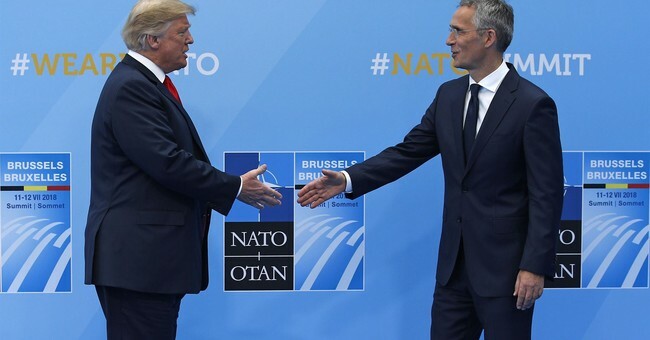 It would require the U.S. Department of Defense to report on military spending by America’s 28 NATO allies, the Gulf Cooperation Council (GCC), Australia, Japan, the Republic of Korea, and New Zealand. Rep. Andy Biggs (AZ) proposed a related amendment, which was included in the House version of the National Defense Authorization Act for FY 2019. The report would show U.S. allies’ commitment to their own security in three strategic regions: Europe, the Indo-Pacific, and the Middle East. It would include raw expenditures as well as military spending as a percentage of GDP, which provides useful context to compare how much a country prioritizes defense relative to other nations. The GCC countries—Saudi Arabia, Kuwait, Bahrain, Oman, United Arab Emirates, and Qatar—spent relatively large fractions of economic output on military functions in 2017, including 4.1 percent of GDP in Bahrain, 5.8 percent in Kuwait, 10.3 percent in Saudi Arabia, and 12.1 percent in Oman. Even so, at the end of March 2018, the U.S. DoD had 507 personnel in Saudi Arabia, 2,311 in Kuwait, 5,007 in Bahrain, 23 in Oman, 433 in the United Arab Emirates, and 648 in Qatar. Military spending by America’s Indo-Pacific allies as a percent of GDP is not nearly as high. South Korea leads with 2.6 percent of GDP. Australia was next at 2.0 percent, then New Zealand with 1.2 percent. Japan spent only 0.9 percent despite nearby challenges from China and North Korea. Maybe islands and peninsulas are relatively easy to defend, or perhaps U.S. troops in the region—28,000 in South Korea, 62,000 in Japan, and more elsewhere—have something to do with it. Europe is the most concerning. Of the central European countries closest to Russia—most formerly under Moscow’s thumb and supposedly most threatened—only tiny Estonia (2.14 percent) and Latvia (2.0 percent) are expected to meet or exceed NATO’s 2 percent goal this year, although Poland (1.98 percent), Lithuania (1.96 percent), and Romania (1.93 percent) fell just short. Several were closer to 1 percent. In Western Europe, nuclear weapons states France and the UK spent 1.8 and 2.1 percent of GDP, respectively. Germany spent 1.24 percent, and Italy spent an embarrassing 1.15 percent of GDP. The pattern is clear: more U.S. troops, less spending. DoD has 47,500 personnel in Germany, 15,400 in Italy, 10,500 in the UK, and only 67 in France. Leaders of European NATO countries claim that Russia is a threat, but they don’t act like it. If Germany met its 2 percent of GDP NATO commitment, it alone would exceed Russia’s $66 billion in military spending. As it is, France, Germany, and the UK combined will spend about $164 billion this year. Prosperous Europe’s conventional arms as well as British and French nuclear weapons can deter Russia from large-scale aggression. Even if the Baltics are no match for Russia’s military, it’s hardly a foregone conclusion that Putin is interested in dealing with resistance and insurgency. The federal government’s most important job is to protect Americans from external threats. Facing mass-murdering totalitarian adversaries during the Cold War required maintaining large numbers of U.S. forces abroad in strategic regions. The world has changed, however. Our allies have rebuilt, and many have become nearly as prosperous as the United States. The threats receded with the Soviet Union’s splintering and Maoist China’s transformation into a stable, if still authoritarian, state. Furthermore, it is dangerous for any global “order” to rely so heavily on a single country’s military power. The United States faces growing debt pressures and is increasingly at risk of a financial crisis, which could provoke sudden and unexpected disengagement. Dependence on the U.S. military is as foolish as it is unnecessary. A world with many friendly but independently capable states is better positioned to withstand challenges and preserve security and prosperity. Redundancy is better than a single point of failure. Ultimately, subsidizing allies through our military—and otherwise—frees up their funds for bloated social programs. Calls to emulate our subsidized allies makes it even more difficult for any of us to get our dangerous debt burdens under control. The first step toward a more secure, more prosperous, more fair world is to keep track of which allies are living up to their obligations and which are not. The U.S. government must serve American interests. And instead of living at U.S. taxpayer expense, our allies must rediscover the virtues of self-government.